Another Glowbal Group restaurant? That is 2 times in less than a week! 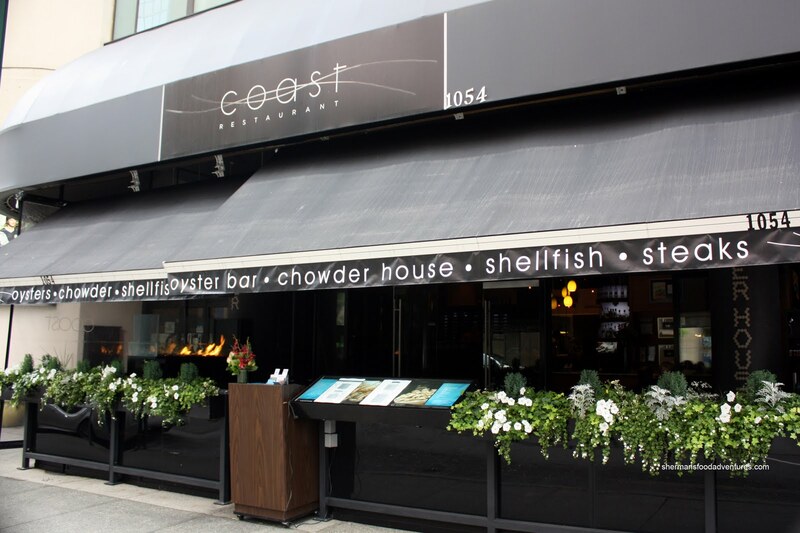 First it was Trattoria Italian Kitchen on Monday, now Coast on Sunday. Somewhere, Kim is rolling in his bed (he's not dead, so can't say grave...). You see, Kim is not a big fan of the Glowbal Group. For me, I'm a bit indifferent. Italian Kitchen was decent for me, Society was not and Trattoria was pretty good. Now it's time for the next one which is Coast. Sanafir and Glowbal are on deck (since visited as well as Black + Blue)! The real reason we ended up at Coast was due to the dietary restrictions of Big German Guy and Miss G. You see, they wanted to eat healthier, in particular seafood. 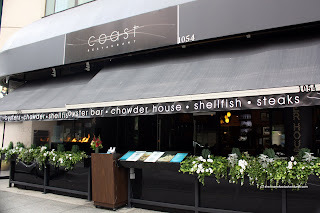 I do realize there are a number of other seafood restaurants in town such as Joe Fortes, Cork & Fin and Blue Water; however, I wanted to try something new. Plus, I wanted to use my Let's go for Dinner card as well. With a bit of gentle persuasion, Viv, Miss G and Big German Guy shared the Signature Seafood Platter. It's not cheap at $29.00 per person; yet considering most other a la carte items cost just as much, it doesn't seem so bad. Included in the platter are Qualicum scallops, sockeye salmon, B.C. 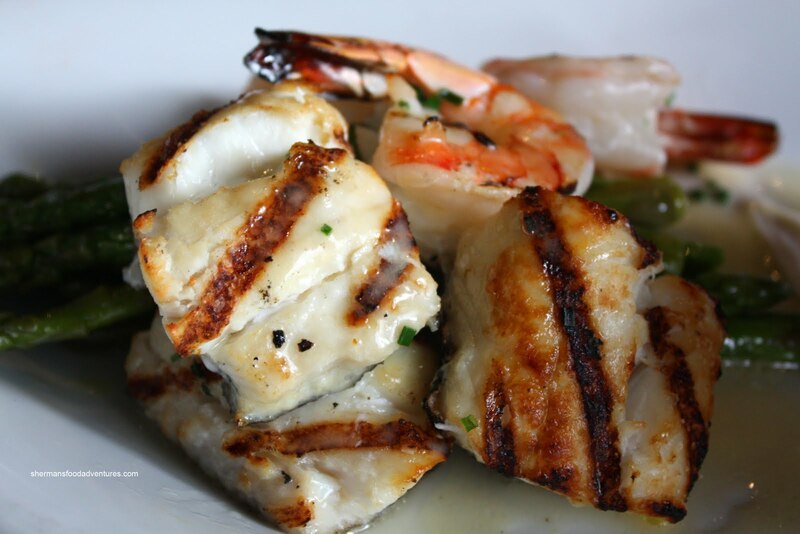 cod, wild sea tiger prawns, asparagus and potato gnocchi. I was able to sample the Sockeye Salmon and it was really moist. There wasn't a whole lot of seasoning to it; but then again, it is naturally flavourful enough. 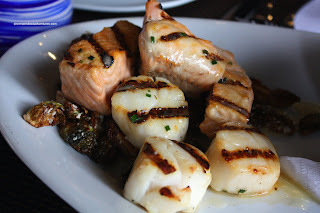 The Qualicum Scallops were huge, sweet and nicely grilled. However, I found them to be marginally overcooked. Underneath, the Parmesan? brussel sprouts were actually quite good and flavourful. As for the B.C. Cod, Viv found it to be dense and bland. On the other hand, the Tiger Prawns were grilled to perfection. In the end, Viv remarked that the platter could've used more seasoning in the form of a side sauces or just lemon wedges. 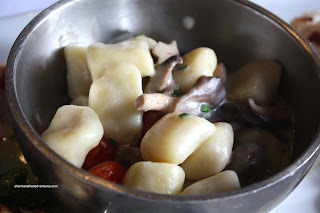 Right in the middle of the patter was a large bowl of creamy Gnocchi with wild mushrooms and grape tomatoes. Much like the gnocchi at Society, I found these to be too big and dense. I did like the sauce, it was rich with a nice earthiness from the mushrooms. 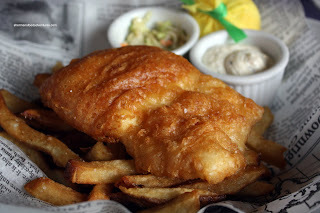 While they were sharing the platter, I went ahead and ordered the Halibut & Chips. 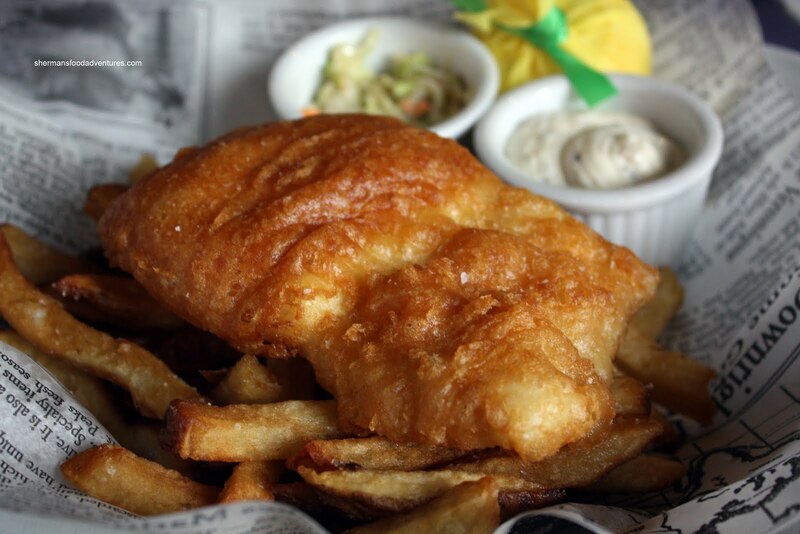 As it was a Sunday, all of their fish & chips were on for $14.00. 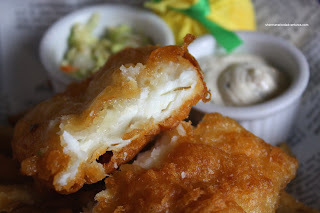 The halibut was fried perfectly, being flaky and moist. Despite the somewhat thick tempura like batter, it was still crisp and actually light. It was tad on the oilier side though. The fries were mostly crispy and I did enjoy them, especially dipped into the tartar sauce (which was nicely balanced). I didn't care much for the Napa cabbage slaw. It was bland albeit creamy. Of course I wouldn't be satisfied with only an order of fish & chips... I tacked on an order of the Lobster Mashed Potatoes. It arrived in a decent-sized portion and there was no absence of lobster. I could definitely see and taste it. The mash potatoes were smooth and creamy. 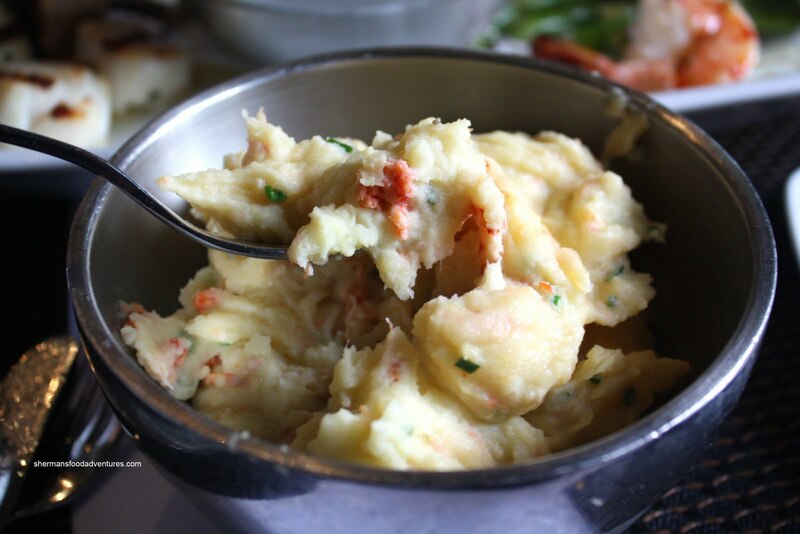 Yet, if I needed to make a comparison, the dungeness crab mash potatoes at Cork & Fin were much fluffier and butterier (not a word is it?). Now, a real nice person wouldn't order a large dessert and eat it in front of 2 friends who were watching their diet right? Well, I ordered the Dessert Sampler and ate it in front of them. Yah, real nice friend I am! 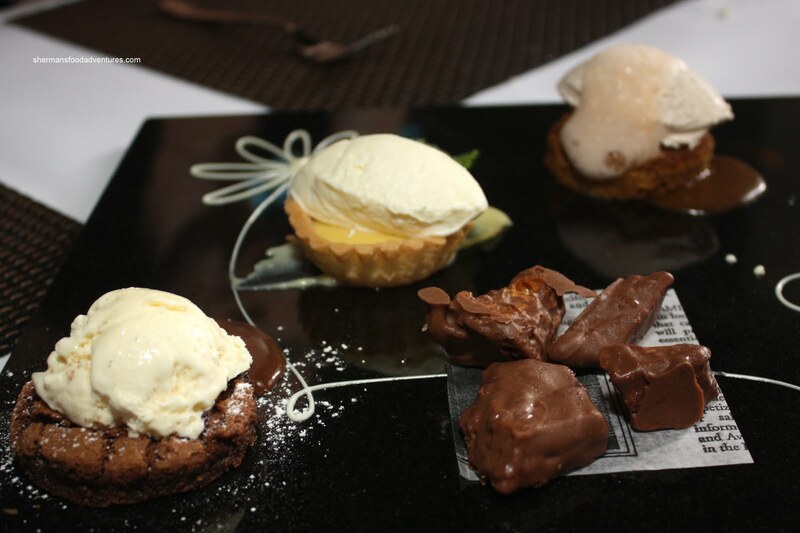 It consisted of 4 different desserts including a chocolate brownie, lemon tart, carrot cake and honey comb nibs. I personally thought that the lemon tart was the best item on the plate. Not too tart, not too sweet, it was pleasant to eat. The tart shell could've been a little less crumbly though. Second best was the brownie. It was served warm and had a nice textural contrast between the slightly crisp exterior and the chewy semi-sweet interior. The honey comb nibs were reminiscent of a Crunch bar; but much sweeter. The addition of salt was a nice touch though. We really didn't like the carrot cake though. It was dense and lacking flavour. Furthermore, the large quenelle of nutmeg cream cheese totally overwhelmed the small piece of cake. Hey, I loved the cream cheese. There was just too much of it. In the end, it was a decent value for $14.00. I realize that the Glowbal Group is not the gastronomical pinnacle of Vancouver. However, in the end, the food was decent. Sure, there were some hits and misses, as with any other restaurant. Consider the fact the pricing is on the high side, one would expect a bit more. Now, that can be tempered by the use of the Let's go for Dinner card or gift certificates purchased at Costco. For me, it is all about the LGFD card. It brought the price down enough to align properly with the level of the food; thus, it was a pleasant experience from that standpoint. The several times I have been there (other instances not due to my own will) I thought the food wasn't worth the $$$. The fact you have to use a LGFD card sort of proves it - what if you don't or decide to go impromptu? Yah, definitely not a random visit if no discount was available for sure. I'd go to Cork & Fin over Coast. With discount in mind, it's alright. Okay for the tourist crowd. "Somewhere, Kim is rolling in his bed (he's not dead, so can't say grave...). " I would definitely recommend the Signature Seafood platter if going for dinner. I do find the place is probably best for a more touristy crowd as well, and am not in any rush to return. I think the cold seafood platter (same price as the hot one you had) has great presentation. It comes on a bed of dry ice so the whole thing seems like it's frothing. Definitely picture worthy, however, I don't know if it filled us up enough for $29 each. Donna, yah, picture worthy, not filling. Discount definitely needed.